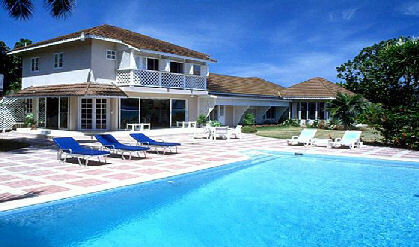 Located just ten minutes from Ocho Rios in an exclusive residential estate, Four Winds is an elegant and deluxe villa. It is a two-story home and the interiors feature spacious rooms and lovely pastel furnishings. It features four lovely air-conditioned bedrooms and four bathrooms. The Master b/r is upstairs and the other three are on the ground level. Downstairs is a large pool room - This spacious indoor/outdoor room overlooks the swimming pool and is perfect for lounging or informal meals. A large grassy lawn leads to a small, man-made pocket beach but a gorgeous white beach is only a few minutes walk away. Outdoor recreation includes a large freshwater pool with diving board, sandy beach (a short walk away), sheltered marina, ocean-side gazebo and well maintained, lighted tennis court. The villa has telephone, satellite television, video, CD player and stereo system.